We are delighted to announce a number of recent internal promotions and staff movements across Queensland. North Queensland Manager, Orlando Pullin has recently transferred to the Gold Coast to lead the RCP team on Queensland Airport Limited’s Gold Coast Airport major terminal redevelopment, Project LIFT. Additionally, Orlando has assumed the role of Gold Coast Manager and will be working to establish an RCP Gold Coast office over the coming months. Senior Project Manager, Richard Foster has replaced Orlando in the role of North Queensland Manager. Richard has over 33 years construction industry experience in project management, contract administration and architecture. He has extensive experience leading project teams across a diverse range of sectors and is well recognised and respected within the North Queensland property and construction industry. We look forward to Richard leading the North Queensland team on some exciting projects including the Mater Pimlico Hospital redevelopment and North Queensland Stadium. In our Brisbane office, specialist programmer, Mark Spencer has been promoted to the position of RCP Associate. Mark has contributed greatly to the success of the RCP programming team over the last 10 years and we know he will continue to play a significant role in the future growth and direction of the RCP programming team. 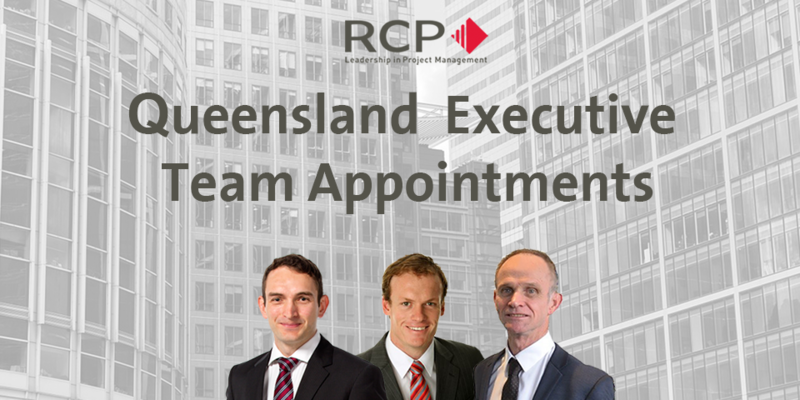 The directors and staff at RCP would like to congratulate Orlando, Richard and Mark on their new appointments and are delighted for them to assume their new roles on the Queensland executive team.